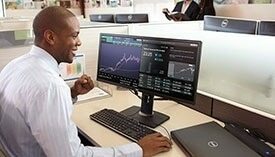 The Dell Wired Business Multimedia Keyboard provides an all-around solution for everyday business computing. The keyboard's 104 keys with mid-profile keycaps allow for efficient, comfortable data input. Seven hot keys let you conveniently access essential applications, like your calculator, email, browser or My Computer screen. Seven multimedia keys let you easily play, pause, rewind, forward or access the main media player screen. Built into the keyboard are two USB 2.0 ports, which allow you to connect low-power devices, such as a mouse or thumb drive, and expand your computer's capabilities. The keyboard includes a palm rest for comfort during everyday use. Ideal for office environments, it is durable, spill-resistant and quiet. Dell Business Multimedia Keyboard KB522. The Dell™ KB522 Wired Business Multimedia Keyboard has a newly refreshed ID and a sturdy/robust design with mid-profile keycap for great typing experience, quiet acoustics and durability for daily business usage. In addition, the Dell KB522 has a set of multimedia and shortcut keys.